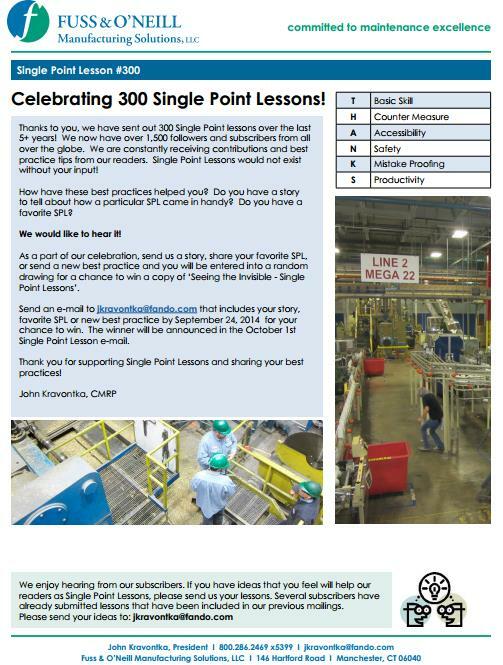 A Lean Journey: Celebrating 300 Single Point Lessons! An idea is a treasure. It can be killed very quickly by a negative comment, or it can be enhanced by a positive one. To get ideas to begin to flow is a very difficult process. Working in teams seems to help idea generation. If someone comes up with a good idea in a small facility it is easy to spread it to another part of the facility or to a similar piece of equipment. If you have a large facility and/or multiple facilities it can be very difficult to spread a good idea, or a best practice. If you cannot spread them, everyone has to re-invent the wheel over and over again, and this can take a lot of time. If we can capture an idea in words and pictures we can then spread it quickly from one place to another. If we categorize the ideas we can then search/find them more easily. We can take these good ideas or best practices and teach concepts with them. This is what we (Fuss & O’Neill Manufacturing Solutions) do every day, teach safety, maintenance and reliability concepts with hands-on training/ideas. We put the best ones out there for everyone to look at, and hopefully utilize to make their company better… While we teach and train, we get our clients results, at the same time. In many instances the ROI for our work is measured in weeks and months..
As the TPM (Total Productive Maintenance) process hit the USA in the early 70’s a Single Point Lesson (SPL) or One Point Lesson (OPL) was a way to train an Operator to perform an Operator based task on a piece of equipment to help maintain that equipment, or to keep it from deteriorating. It focused on a “Single Point” or idea and by using many pictures (visuals) it quickly got the point across about what the Operator needed to accomplish. It also created Standard Work around that task. At that time a major thrust of TPM was to have the Operator perform simple maintenance tasks (transfer from Maintenance) so that the Maintenance Technician could then do more work or different work. As the TPM process matured here in the USA, the SPL’s also began to change. They started to become more of a way to document a great idea, normally a Maintenance idea that would help improve the Safety of the equipment or keep a piece of equipment clean (documenting a Countermeasure), or improve the access to the equipment (make it easier to maintain), etc.